I live right in the heart of Santa Cruz city. It is a crazy jungle of tangled electrical wiring, crumbling adobe and sagging red rooftops. Even when I am alone in my little condo I can sense the beat of the city as people go about their daily lives…booming tropical rhythms, car horns constantly blaring, the scratching scraping sound as the washer woman in the building next door scrubs the heck out of the clothes. And then there are the smells. At any hour of day or night someone somewhere in the neighborhood is having a barbecue. I live within a stone’s throw of one of the city’s largest street markets. That brings its own collection of interesting aromas. The football stadium is four blocks away….faint cheers, chants and whistles on weekends and, if the wind is blowing the right way, I get to hear all the concerts for free. It is colorful and somewhat joyful…nothing “plain” about it, that’s for sure. I have been going through old pictures. Here’s a reminder that there are some simple, “plain” places to which one can go to escape all the man-made mayhem. Right here in the city there is a very odd and very large and unexpected stretch of sand dunes. Go there mid-week and you can have it to yourself. On weekends it becomes yet another venue for salsa music and barbecues. 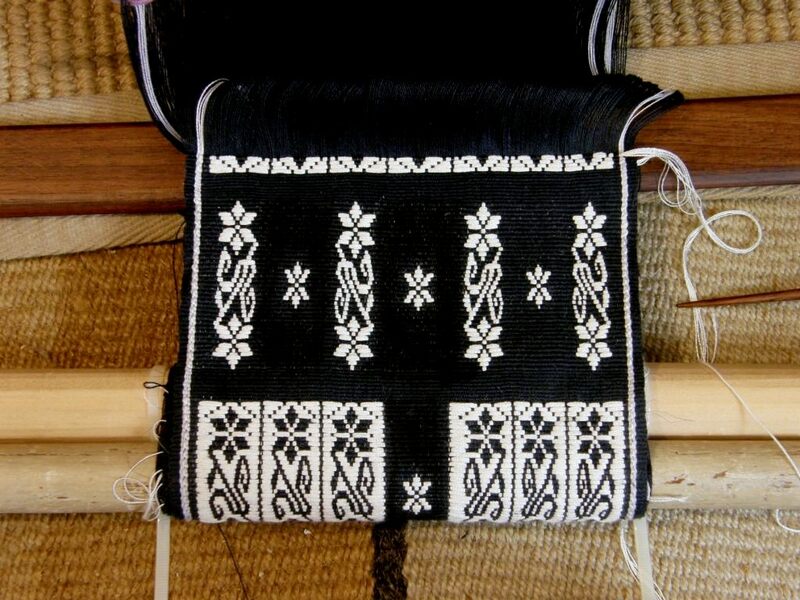 I am weaving the black panel of my wall hanging project. Nothing plain about this. In fact, I have to keep stopping and checking myself…how much pattern is too much…have I gone too far? Is it too much, overdone? The thing is, I am still learning LOTS of lessons from weaving this piece and so I won’t be using it for the wall hanging. I will finish it and keep learning from it. There are definitely some things I would do differently a second time around. Luckily I have a whole lot of green Guatemalan cotton that I can dye black for a second attempt and I think that my silk supply will hold out too. I can probably make something nice from what has now become another “sample” and I will start again on the wall hanging panel. I will tell you just one of the lessons I learned. 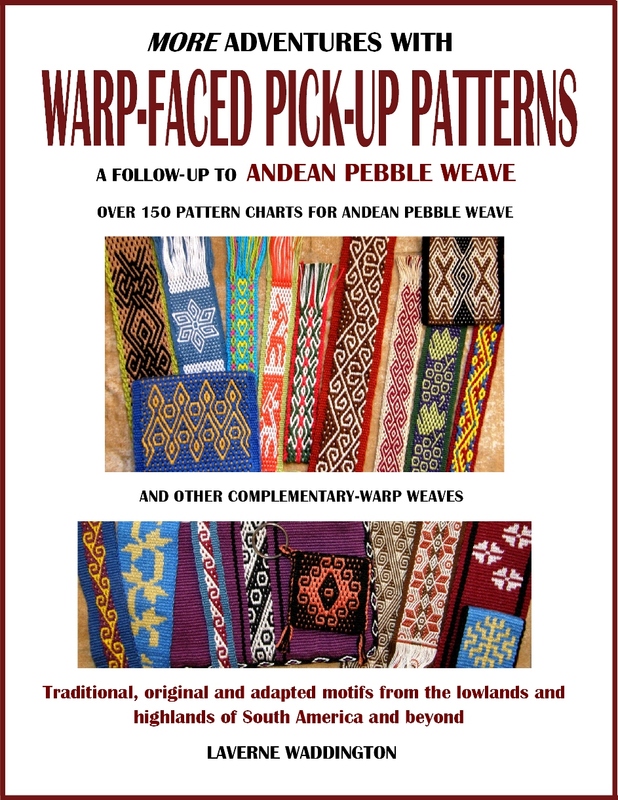 If you are doing plain weave and using black warp and weft it really doesn’t matter if some parts of your piece are a little less warp-faced than others. You won’t be able to notice that fact. 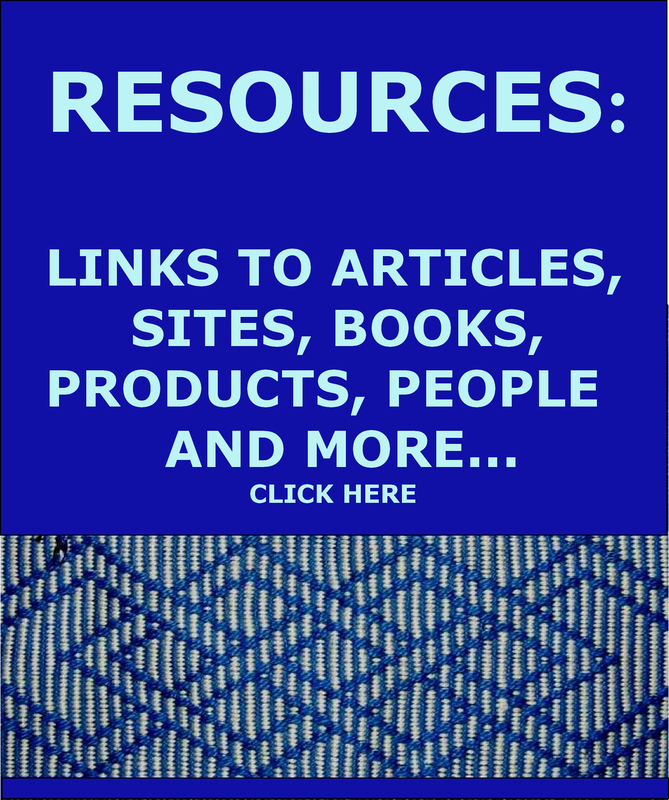 However, when you are using a white continuous supplementary weft, it DOES matter. The smart thing to do is to put that white weft in as a tester right at the beginning. That way you will be able to tell if some of the black warps have a slightly different spacing to others as the white weft will show through. You can then go about shifting and settling the warps so that their spacing is consistent and completely hides the white weft. 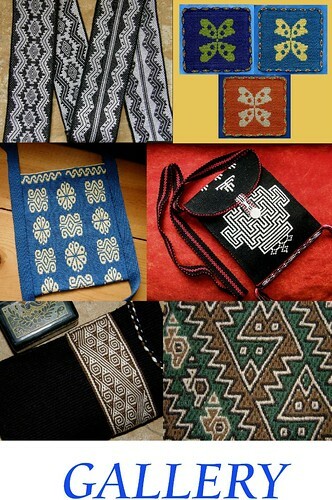 At the same time I have been doing a little study of some of the different ways that indigenous weavers here treat the plain parts of their woven pieces. By plain parts I mean those that do not have any kind of pick-up patterning. Sample 1: A rolled edge. There are actually 18 brown warp ends there on that border that have been woven and rolled to form a sort of tube edge. The edge is good and thick and would provide very good protection for the sides of a belt. 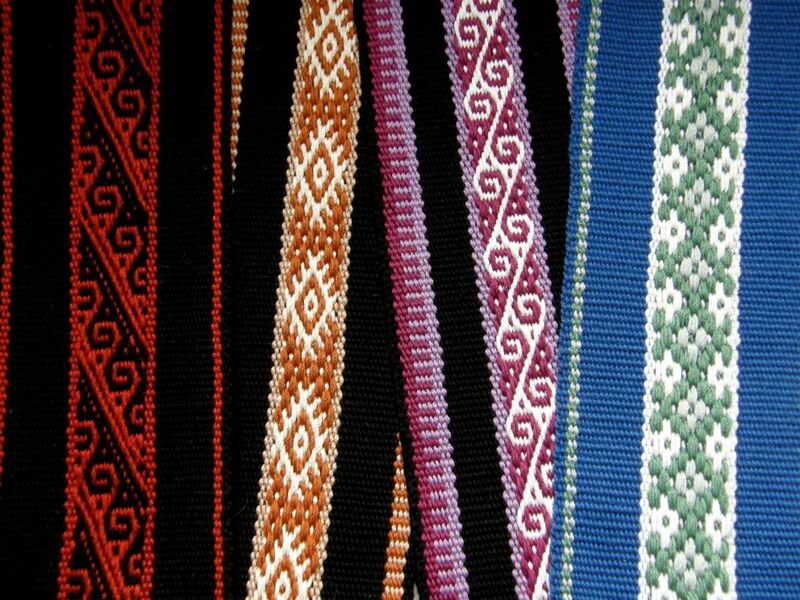 The weavers from San Ignacio de Loyola use this kind of edging for the plain weave that borders their belts. 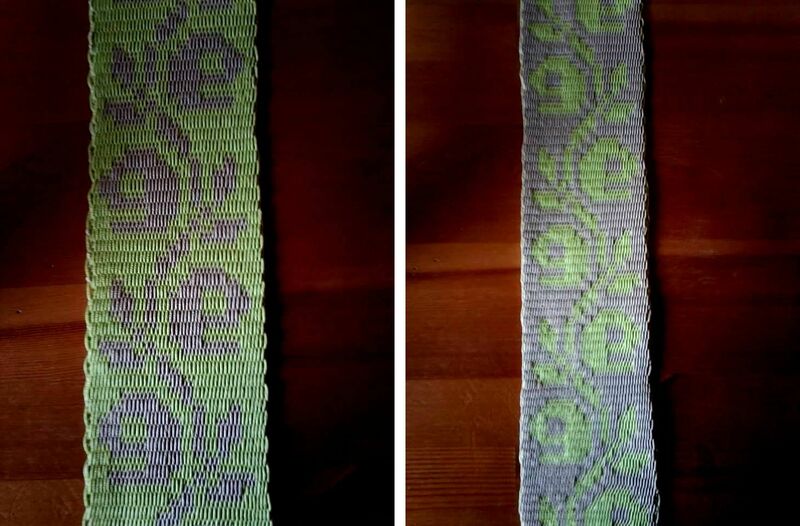 Sample 2: Two-weft-span borders. I learned this method from my teacher Maximia in the Bolivian highlands. 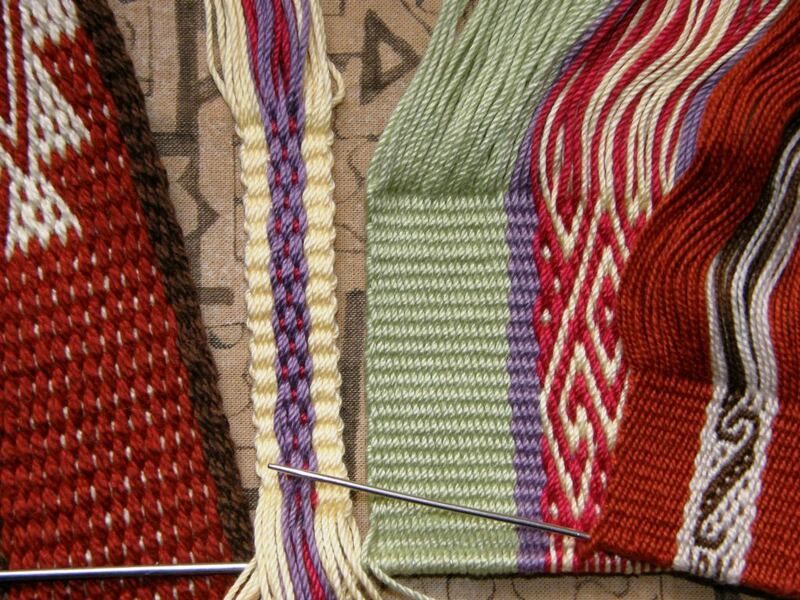 Look at difference in the yellow edge on sample 2 and the green 1/1 plain weave border on Sample 3. 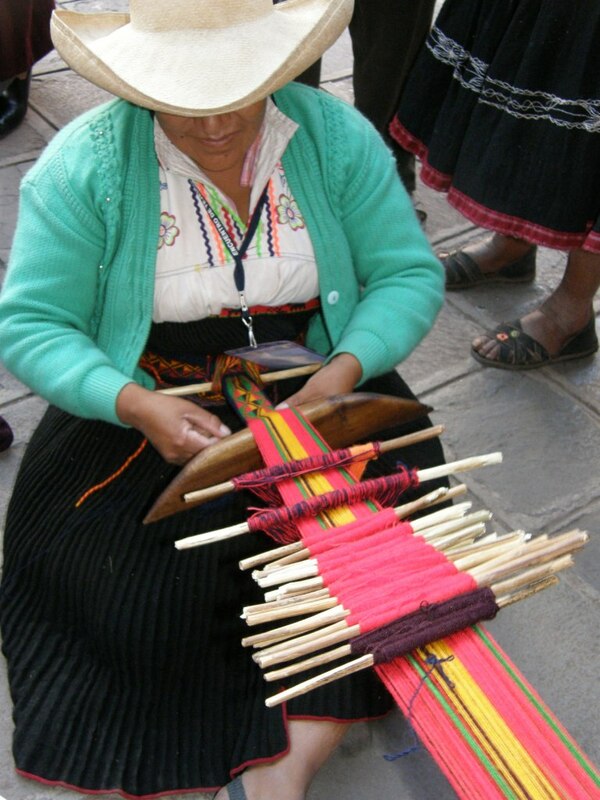 Maxima makes a cross with her fingers while she picks the various colors needed to create her pebble weave pattern. She first takes the borders from the far side of the cross, then works her way across the warp picking her pattern , She finishes by taking the borders from the near side of the cross. This is what enables her to form the two-weft-span borders. Sample 3: 1/1 Plain Weave. Using 1/1 plain weave as the border gives the pattern area another dimension. 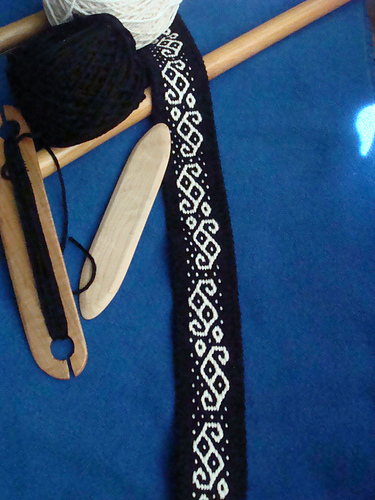 The border remains “flat” and the pattern area is raised. This is a very nice effect. Sample 4: Intermesh border. 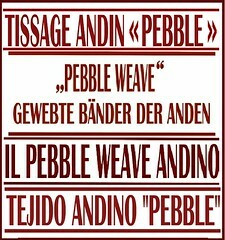 This is the “thick border” that I explain in Andean Pebble Weave and was taught to me by weavers in Ayacucho. 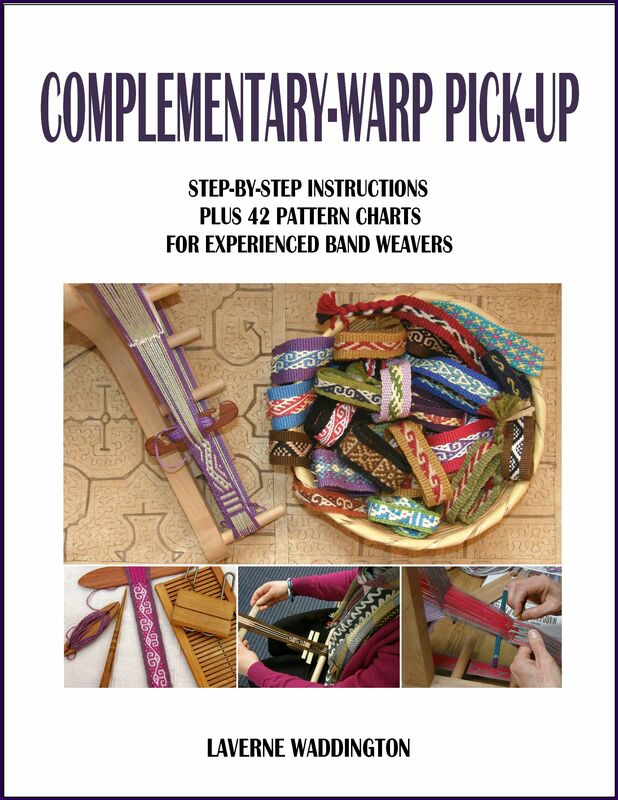 Because it is a three-shed structure, it is the perfect companion to the two-heddle pebble weave set-up. The plain borders match the thickness of the pebble weave sections. 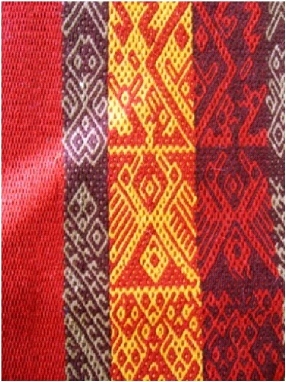 In this pebble weave piece from Ayacucho, the red plain area on the left is woven using the intermesh structure. Here are some of the sample bands that Maxima and I wove using the border method in Sample 2. My cell phone pouch uses the method in Sample 4 for the plain red sections. The method I most use is that in Sample 4…intermesh. Oline friend Larisa sent me pictures of her project using intermesh using scrap yarn for learning purposes and so the piece does not have as good a contrast in colors as she would have liked. She says that she believes that intermesh is good for “bold statements”. Larisa tells me that her rosebud motif is based on one from Palestinian embroidery. Gorgeous! 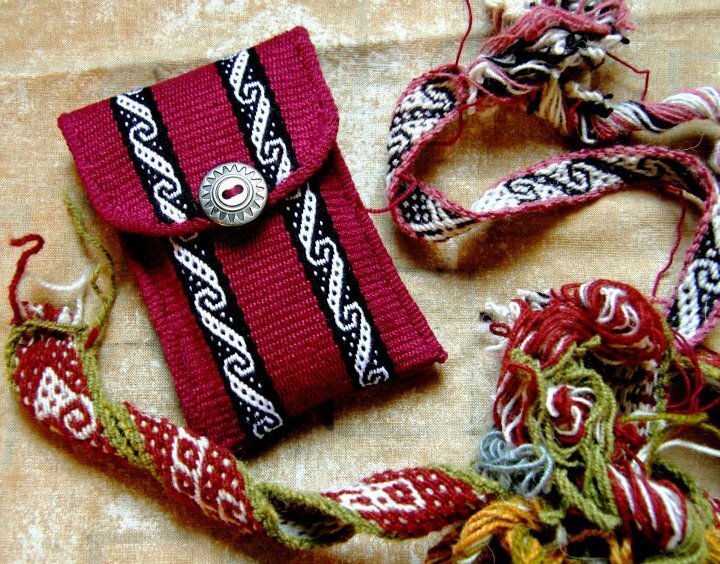 Julia used Plymouth Yarn Fantasy Naturale to make the pebble weave band, below. This yarn, for me, is the perfect weight for making a backstrap and I have used it often for that purpose alongside some doubled Tahki Cotton Classic for additional colors. You will need two skeins of Plymouth for a backstrap in the dimensions I give in my WeaveZine article. You can see one of the beautiful swords in the picture from Magical Moons. My backstraps made from Plymouth Yarn Fantasy Naturale and doubled Tahki Cotton Classic. Julia wove with me one day and we played with the finishing techniques shown below in which we worked with tubular bands, coil stitches and cross knit looping. 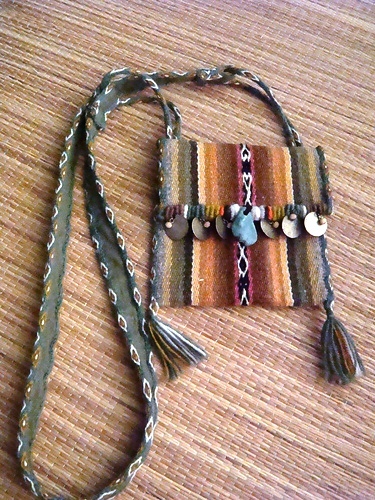 The broader part of the strap is two tubular bands edging a piece of linen. Beautiful work and she had just the right colors of yarn for this project. How much pattern is too much? I don’t think that you are there yet! I thought of you today when I went in the shops in downtown Santa Cruz here and found that not only are the “Tribal” patterns still popular, but there are interesting new ones! Wait ’till you see the leggings I bought! And the other thing that is really popular- black and white patterns! Laverne, don’t you just love the solace of spending time in the sand dunes early in the morning or about sunset in the evening? 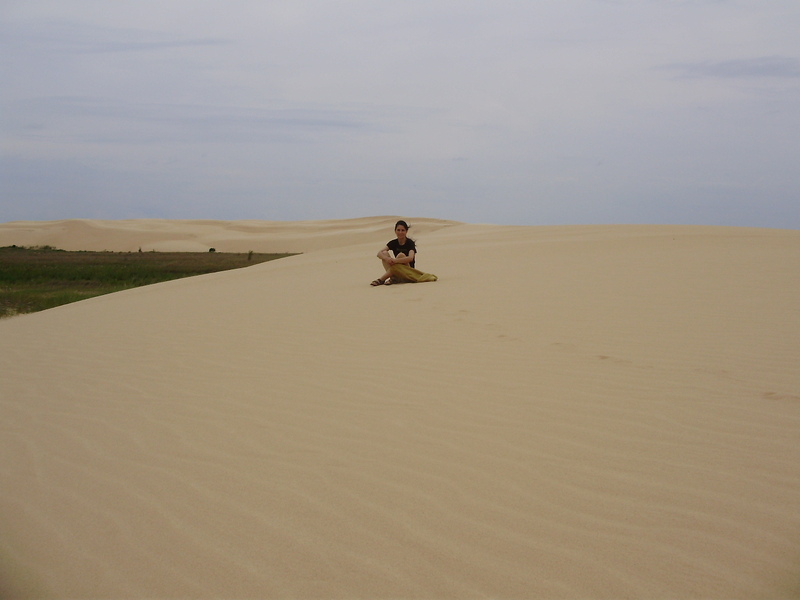 I spent my teen years in Odessa, Texas with Monahans Sand Dunes State Park nearby. I love the rhythm and shapes, the undulations and ripples of dunes. I enjoy the feel of the sand on bare feet. The way that sand dunes muffles sound is amazing. Believe me when I say that I completely understand your desire to escape the noise of the city by going to the sand dunes. 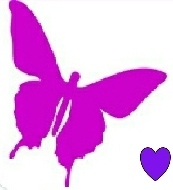 Laverne, your work is exquisite and inspiring! Reading your posts is something I always look forward to. 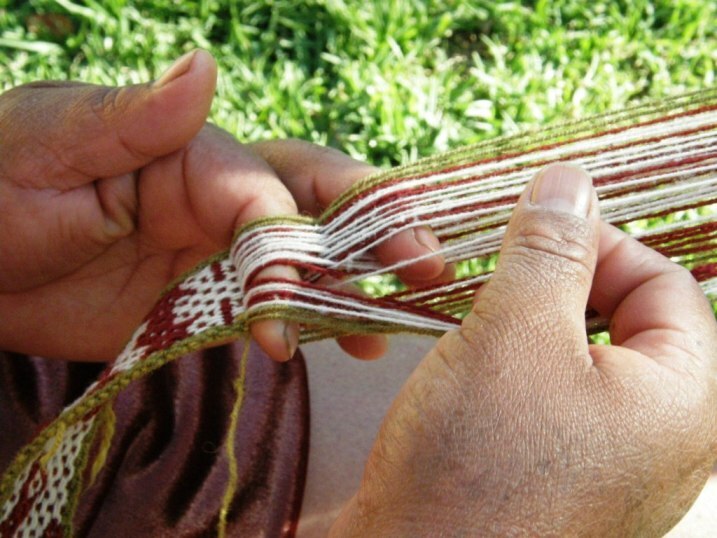 I go back to my own weaving with renewed energy and ideas for things I want to try. Many thanks!